If you are searching information on gold bullion market in Thailand, you will probably be left disappointed. Gold bullion market in Thailand is synonymous with obscure black market that has been created for tax evasion purposes and facilitates gold smuggling. So most gold bullion market in Thailand places keep very low profile and deal with word to mouth customers. Surprisingly, gold jewelry has been one of the most popular forms of gold investment in Thailand. Gold jewelry is also very liquid in this country and could be easily resold virtually anywhere to pawn shops or gold jewelers. Again, it’s virtually impossible to calculate the annual turnover of Thai gold bullion market since most gold trading is done through a series of “antique” stores that misreport their sales in order to avoid paying state taxes. It’s just a way of gold dealing in Thailand that has been this way for quite some time. Unfortunately, this obscure and low profile gold bullion market in Thailand does not promote any technological advances in jewelry or bullion making industries in the country. However, the times are slowly changing in Thailand and many gold investors started paying more attention to gold bullion products as means of investing in physical gold opposed to costly gold jewelry. 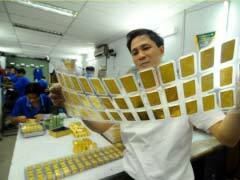 At this time gold bullion market in Thailand still remains non-transparent for foreign investors. If you are a gold investor buying physical gold in Singapore or anywhere else in the world, the general safety advice is to avoid buying Thai gold bullion products since most gold dealers outside Thailand will not buy your Thai gold from you in case you decide to sell. Would you like to learn more about how to open a gold investment account in Malaysia or gold bullion market in India, we’ve got you covered. Our website offers many helpful articles on this subject.